CST Inc., a 29 years privately owned Memory Tester Company has announced it is the first to market and demonstrate its New SP3000-DDR3 1700 Mhz DIMM Tester and have started deploying multiple units of the DDR3 1700Mhz Memory Test Solution at several major OEM Memory Manufacturers world-wide. The new SP3000-DDR3 1700Mhz tester is capable to test the PC3-6400 (DDR3-800Mhz), PC3-8500(DDR3-1066Mhz), PC3-10666 (DDR3-1333Mhz) & PC3-12800 (DDR3-1600Mhz) Long DIMM Memory Modules. This makes CST, Inc. the first in the industry to provide an Affordable Real-Time Test Solution for the latest DDR3 240-pin standard DIMM memory module. The New SP3000 is DDR3 1700Mhz Ready ! "CST new 1700Mhz DDR3 Memory Tester solution will offer the major memory OEM manufacturers the opportunity to quickly adapt and ramp up volume production for both DDR3 DIMM and SODIMM memory modules more efficiently and to reduce testing cost , said York Sun, Senior Sales at CST China". 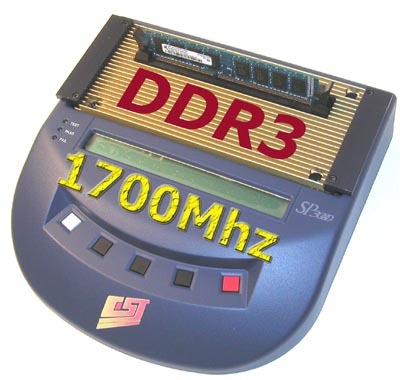 The "SP3000 1700Mhz DDR3 Adapter" is built to work with the CST universal SP3000 base tester, which allow user to swap inter-changeable DDR2,DDR, SDRAM & DRAM test adapters. With a simple push button, the SP3000-DDR3 tester quickly auto-identify and displays the memory size , clock frequency, speed, Unbuffered memory module. It even reads and programs SPD EEPROM on the DDR3-SDRAM DIMM. Special mechanism is included to satisfy the new JEDEC "Reversible SPD Protect" specifications also. CST offers a special optional stacked convertor for customer who needs to test large volume of DDR3 204pin SODIMM module on the CST - SP3000 DDR3 1700Mhz DIMM Tester. 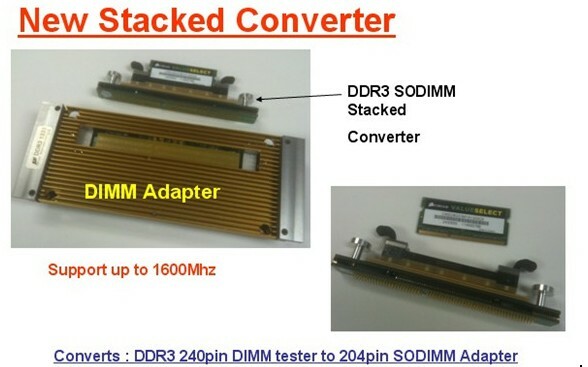 The New "SP3000 1700 Mhz DDR3 DIMM Adapter" series tester provides added troubleshoot capability for the present and future DDR3 memory modules at affordable prices. It is targeted for the DIMM/SODIMM manufacturers, computer integrators, memory distributors, and service depots. It is indeed the fastest tester and the easiest to use in its class. Advanced PC software is available for interfacing to a PC. The SP3000-DDR3 1700Mhz tester can also be interface to CST ‘s RoboFlex2 handler with a special modified Pusher System for mass volume testing. CST is accepting orders now for the SP3000 1700Mhz DDR3 Tester with a 1 week delivery leadtime..